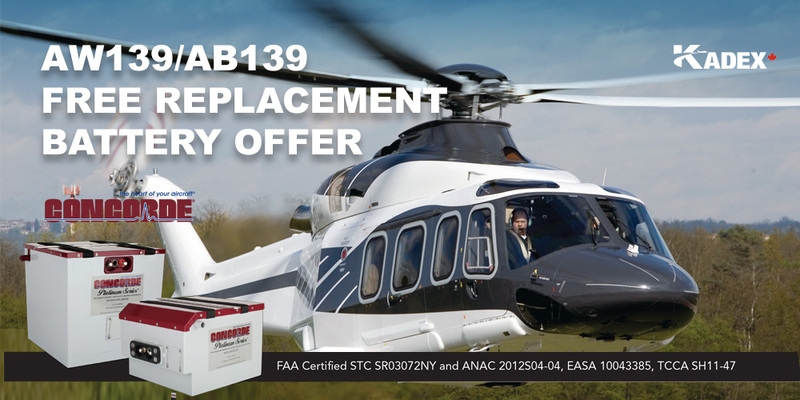 Thats right AW139/AB139 operators, With purchase of Concorde’s high performance batteries and STC through your preferred Concorde Distributor receive a FREE Replacement battery. Switching to Concorde Batteries Enjoy improved starting performance and cooler starts. When the time comes, contact Concorde for a FREE replacement battery. Simply provide a copy of the STC Letter of Authorization, proof of battery and STC purchase, and a shipping address to receive the battery of your choice at no charge. This offer is valid for STC conversions completed by September 30, 2018.